With the rise of cryptocurrency comes a whole new range of problems that need to be addressed. Open Platform believes that a significant one, is that there is no easy way for mainstream developers to accept and integrate cryptocurrency. That’s why they are proposing a two-way communication system between an application’s back-end and the system they are interacting with on the blockchain. This is aimed to make it easier for developers to adopt cryptocurrency technology, and prevents the need for developers to learn each blockchain’s language. It will comprise of both on-chain and off-chain infrastructure. On-chain for handling payments, asset issuance and user authorization, and off-chain to update components that are part of a centralized application stack. They believe that most applications might not ever be 100% decentralized, and that there is a huge market opportunity here, with payment platforms focused on applications being worth a lot – as an example, PayPal is worth $90B. What is the utility of the token? Application developers can use Open Token to accept payments. The token powers infrastructure and provides a mechanism to grow developer adoption of the platform, and supports the community of users. Who is behind Open Platform? CEO Ken Sangha is an Entrepreneur and Startup Advisor who has previously helped grow a casino app into #1 in iTunes UK. He is joined by CTO Andrew Leung who was the lead new team for billion dollar software company Pivotal Labs, as well as being the Lead Architect and Design for the app Grinder. The rest of the team includes Blockchain Lead, Abhishek Punia, Lead Architect, Chase Smith, Solidity Developer, Dustin Sinkey and Director of Strategy, Roger Jin, to name a few. 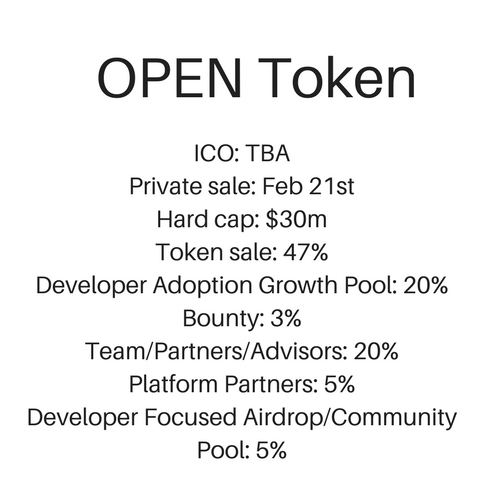 We rate Open Platform as a Solid ICO, due to their teams experience in growing businesses, and the idea behind the ICO – which aims to be a bridge between mainstream application developers and the blockchain. To join their whitelist, click here. Note: No payment was made by this ICO for this article. We always label our sponsored content clearly at the top of the article.